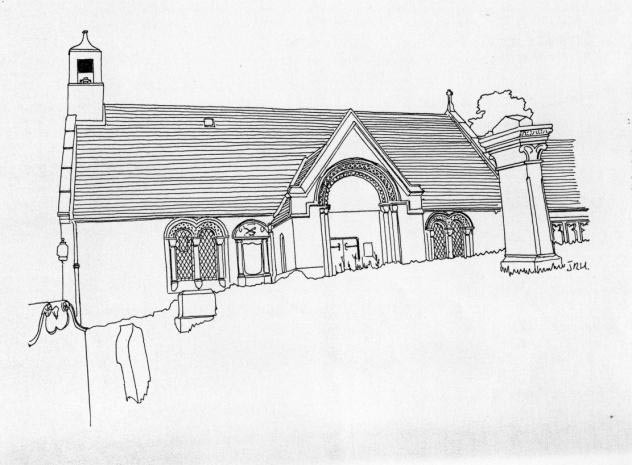 On a sandy knoll, a 12th-century church much altered in 1616, 1774, 1813 and finally restored to an approximation of its Romanesque appearance in 1912 by P MacGregor Chalmers. It retains its Norman feel and today the visitor enters under a unique stone tympanum to discover an attractive nave and substantial chancel, the arch richly carved (1912). A Norman font and chancel stalls are of particular interest. Linton Kirk is most noted for the stone above the porch said to depict a knight on horseback lancing two creatures. The stone is Norman and unique in Scotland, and legend suggests that this is the first known Somerville killing a worm. The Leishman father and son ministries completed most of the present improvements.